United States Mint Sets are complete coin collecting sets of uncirculated coins produced by each mint that particular year. These coin sets contain one uncirculated coin of each denomination minted that year, in the original minted condition. For example, each year's set of coins contains a penny, nickel, dime, quarter, half dollar, and dollar coin minted in that year. Keep in mind that it is possible that not all denominations were produced each year and some may have been made with more than one design. So your coin set may not contain every denomination listed above or it could contain more than one of a particular denomination. An example would be the 50 state quarters. The sets from the years the quarters were made will contain five quarters, one of each of the five states represented that particular year. Unlike proof coin sets, the coins in these uncirculated sets are not minted with any special considerations regarding quality. They are the normal coins that are intended for circulation that are specially packaged by the mint as a coin collecting set. Except, these coins are UNCIRCULATED. Coin Sets were first offered by the United States Mint in 1947. From 1947 to 1958, the U.S. Mint included two coins of each denomination. These coins were mounted in cardboard holders. In 1950, however, no coin collecting sets were issued. In 1959, the U.S. Mint began using sealed transparent packaging (as shown in the top photo), to help preserve the coins. At that time they began only including one coin of each denomination in the sets. During the years 1965 through 1967, SMS (special mint sets) were issued. 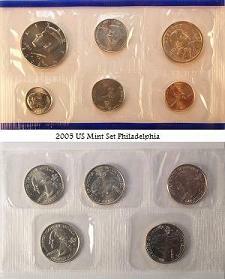 The coins in these sets were packaged in special cases made of plastic, and were closer to proof coin quality. 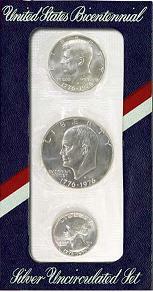 A special three piece Bicentennial Set was issued in 1976 in addition to the regular set issued. The three piece set contained the Bicentennial quarter, half dollar, and dollar made with 40 percent silver. These coins were also in the regular coin set for 1976, but they were not made of the silver composition. They were a nickel and copper alloy. Official sets of coins were not released by the U.S. Mint in 1982 and 1983. Proof coin sets are also official coin sets from the United States Mint except that the coins contained in each yearly set are all proof coins. Silver Mint Coin Sets and Silver Proof Sets are also available. If you are interested in collecting these coin sets, you can find the coin collecting sets for the current year at the U.S. Mint's website.